In North Dakota, there are 7 facilities that offer welding training programs. The list contains schools, colleges and Job Corps. Just read the article to get info about available schools and welding in common so you can make the best choice. Welders heat and melt metal pieces in order to join them together. To perform their job, welders should be able to use numerous tools and technics. Methods and equipment vary depending on projects’ specifications. Welding is an absolutely rewarding career but still, it’s just one of the reasons for becoming a welder. One other point is that this career has an incredible outlook in North Dakota as well as all over the USA. According to the US Bureau of Labor Statistics, the number of job offers for welders will grow by 6% until 2026. It means that there are lots of job offers and their number is going to increase constantly. Another point is that this career guarantees your financial stability. It’s pretty easy to find a job right after graduation and gain a good salary. IN fact, welders have a rather high income. Of course, choosing a career, it’s absolutely important to learn about a salary you can earn in the future. In this section, you can find some info about welders’ salary in North Dakota and all over the country. Speaking of an average median salary, welders in North Dakota earn about $52 210 or $25.10 per hour. It’s pretty much higher than a median salary throughout the country which is about $39 390 per year. The top 10% of welders nationally earn about $62 100 annually. At the same time, the top 10% of welders in North Dakota earn $87 500. There are 7 welding certification schools in North Dakota. It’s important to say that all the schools from the list are approved by the American Welding SENSE Accreditation Program. We’ve prepared for you some useful data for each school. Bismark State College, which is located in Bismark. If you want to earn your Associate of Applied Science degree there, you should complete “Prescribed Technical Program” credits as well as general education credits. There is also a bunch of other technical associates degrees such as Electrical Lineworker or Mechanical Maintenance Technology. Lake Area Career and Technology Center. It is located in Devils Lake and is associated with the Devils Lake High School. Lynnes Welding Training, Inc. It has facilities in both Bismarck and Fargo. The school provides 16-week as well as 12-week welding programs. North Valley Vo-Tech Center is among the best welding certification schools in North Dakota. The North Valley Vo-Tech Center also offers degrees in a variety of similar vocations as well. North Dakota State College of Science, which offers an excellent welding certification program. Here is not only the list of the best welding schools in North Dakota but also their contact info. Welding is an absolutely amazing job but if you aren’t sure whether you want to work as a welder, you should consider some other options. There is a lot of similar career options that may interest you as well. 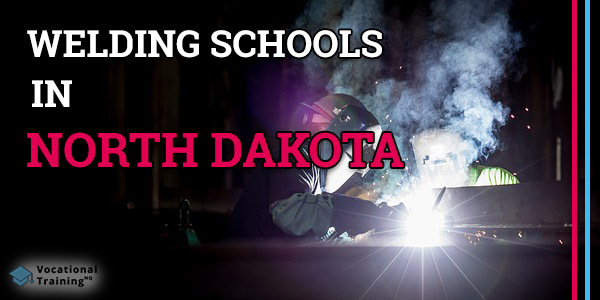 There is a number of good schools that offer welding training programs in North Dakota. You just need to take your time and learn about each school so you can make a final decision. In any case, we wich you luck with your future career.